M52 FUZE. General. This standard fuze, (fig. 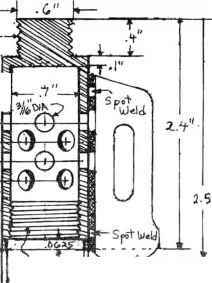 12), a super-quick type, is identified by PDF (point detonating fuze) M52 stamped on the body. This fuze is designed to function before any penetration occurs, permitting the maximum surface effect of fragmentation of the shell. For use in the field, it is issued assembled to the shell as a part of the complete round. To prepare for firing it is only necessary to remove the safety wire. Safely features. This fuze is classified as bore-safe. It is equipped with safety devices that keep the bursting charge from exploding while the shell is in the barrel—even should the primer or detonator malfunction. A safety wire passes through the body of the fuze and the set-back pin, thereby locking all movable parts in their original safe position. Pull the safety wire just before firing (fig. 12). If a round is fired without pulling the safety wire, it may or may not explode upon impact. The safety wire is designed to lock the set-back pin in place only during normal handling of the round before firing. The set-back pin, held in place by the safety wire, in turn locks the safety pin in position. The set-back pin is supported by a spring and is positioned in a recess of the safety pin. Until the sct-back pin moves out of this recess the safety pin is locked in the body of the fuze. The safety pin, held in place by the sct-back pin, is the main locking device of the fuze. It holds the slider (which contains the primer and detonator) in its retracted position and prevents premature alinement of the various elements of the powder train. Functioning. 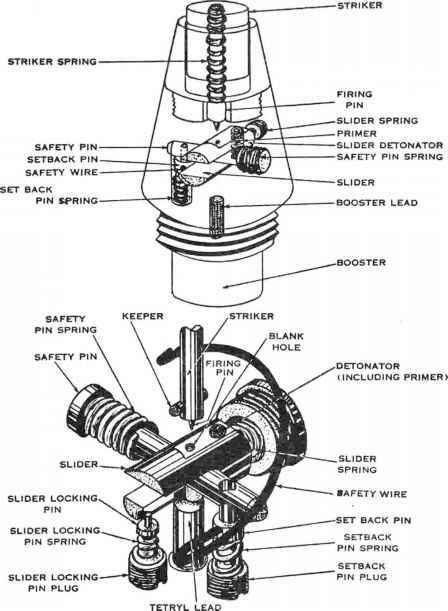 The fuze is not armed until the primer and slider detonator arc alined with the firing pin and booster lead. The first step in the arming of the fuze m the removal of the safety wire just before firing. The shell, when inserted in the barrel, slides down until the primer of the ignition cartridge strikes the firing pin of die mortar. The combined forces of the shell striking the breech of the mortar and the blow delivered to the shell by the propelling charge gases cause the inertia of the set-back pin to overcome the resistance of the setback pin spring. This permits the set-back pin to move toward the base of the fuze (fig. 12). This movement withdraws the shank of the setback pin from the recess of the safety pin. The safety pin, now being released by the set-back pin, is thrown outward by the action of the safety pin spring, but is prevented from leaving the fuze by striking and bearing against the bore of the mortar. At this time, the safety pin has not moved far enough to disengage the slider, and the slider remains locked in its unarmed position. 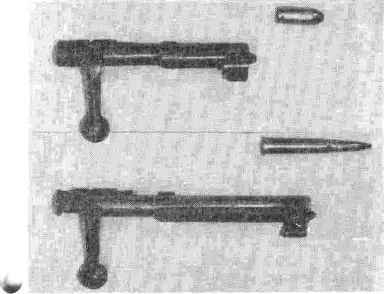 When the shell leaves the muzzle and the safety pin no longer rides against the bore, the pin and spring fly out of the fuze, thereby releasing the slider. Under the action of the slider spring, the slider is forced to the opposite end of its chamber. 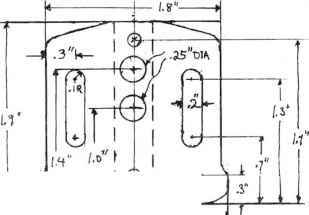 The slider locking pin, pressed upward by its spring and guided by a groove in the lower surface of the slider, is lined up with a recess in the slider. The spring forces it into the recess, locking the slider in position and completing the alinement of the powder train. At this time, the fuze is completely armed.